Engagement rings are the symbol of your betrothal, traditionally, but not necissarily, worn on the fourth finger of the left hand. Engagement rings feature a diamond, the hardest sustance in existance and the most perfect of gemstones. Our engagement rings are all made in our own workshop with the highest quality materials. These engagement rings are supplied with non-certified diamonds. 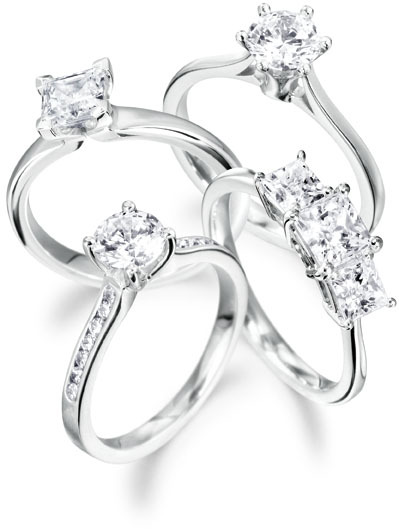 For certificated engagement rings view our ring designer section. All of our rings are certified as Conflict Neutral and are supplied with an independent valuation report. Rings are made to order, usually within 14 days. For other combinations, metals, designs etc. or to discuss a bespoke custom design please contact us.